MRI Distortion Check Software - Automated Analysis of Distortion in MRgRT - Coming Soon! 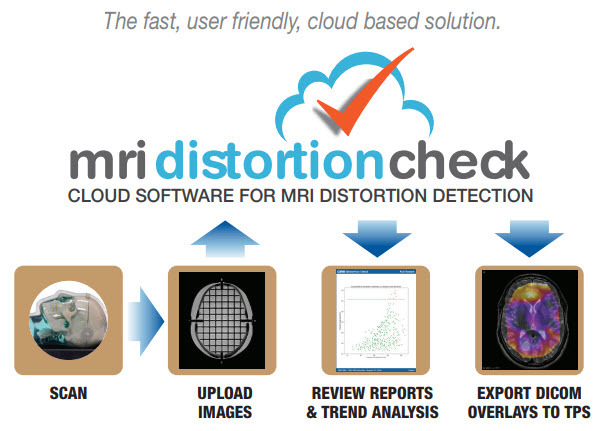 MRI Distortion Check is a new, cloud-based solution designed to quickly and automatically quantify distortion in MRI images. Used in conjunction with CIRS MRI Grid phantoms, the software provides the capability to quickly and accurately measure distortion through out the entire image volume. After detecting all grid intersections, the software registers either a CAD or CT scan ground truth to these MR detected control points. An interpolation is then performed to generate the 3D distortion vector fields. Results can be reported in a variety of output formats including scatter plots, contour plots, box and whisker plots for trending and DICOM overlays that can be imported to TPS or other 3rd party software. The software algorithms will work with any grid configuration and CIRS employs proprietary 3D printing techniques that enable easy modification of grid phantoms to meet customer requirements.